After reading Jeffrey Overstreet's warm review of the film I thought I was appropriately prepared for the experience of viewing it. I am not ashamed to say that I fell asleep during the middle; it was a truly peaceful nap. Honestly, I don't think the sleep came because I was bored but because I had truly entered the great silence of the place and people represented. Plus it's almost three hours long so I still had plenty of time to absorb the overwhelming beauty of the film's artistry. 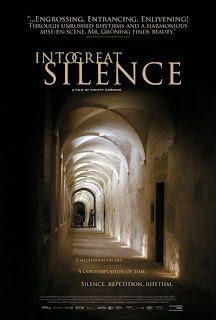 Of the three layers I discovered during meditation on this theme, this film depicts most accurately my first response to the word silence. I mean -- really -- what could be more monastic and mysterious than the lives of the Carthusian monks? And what could be more impossible for me to imitate? So, I guess I'm off the hook? When is the last time you believed someone who speaks of God's loving character with this kind of believability? Do we believe the witness just because he's old and adorable? Maybe. Do we believe him because he lives in the alps and wears a white robe? It depends on your view of the monastic life. Certainly, anyone who has given themselves so whole-heartedly to an ascetic life deserves, at the very least, our respect. We who can not make it to 9:02 without a super-size mug of caffeine. We who can not drive the .62 miles to the caffeine shop without searching 1, 2 or 3 radio stations. We who can not stand in a grocery line without the scrolling kaleidoscope of the 24/7 news channel. So, yes, a man who has willingly stripped his life of our contemporary cacophonous accouterments deserves a little bit of our attention. And trust. But, for me, it comes down to this. Am I willing to live this entire three-score and ten years -- give or take a decade -- without experiencing at least a taste of this gentleman's simple assurance in God's good character? I want to believe the same things, experience the same peace, but without the same lifestyle. So I pile on more Christian radio, more book studies, more worship songs, more entertainment, more food, more chatting -- more noise -- in search of the the moment where I can truly believe God is good and God loves me. This is not a peaceful existence. You know it, too, don't you? From the half of the film that I was awake for, here are a few ways I can model the monastic life. 1. Fear God when taking a vow. Under my father's counsel, Brian and I chose to include this Scripture reading in our marriage ceremony 18 years ago. And, honestly, there have been more than a few moments when the fear this passage induces was the only thread keeping me from snapping the line of commitment to this man, my husband. But the Ecclesiastes passage speaks from a holistic perspective. My covenant relationship with the one true God is the foundation for every relationship I form. 2. Assume a posture of humility. Watch your step when you enter God's house. Enter to learn. That's far better than mindlessly offering a sacrifice, doing more harm than good. Don't shoot off your mouth or speak before you think. Don't be too quick to tell God what you think he wants to hear. God's in charge not you -- the less you speak, the better. Imagine if our Sunday worship services took this passage seriously. Imagine if we let go of our pep-rally-as-a-means-to-God mentality. Maybe the Church suffers from the same malady that showed up in me when I tried to pray my way into silence . I do not conjure up the Presence of God with my chatter - no matter how doctrinally sound the words may be. If I pay total attention to the lessons of Scripture, which is the more demonic-friendly -- being quiet before God and trusting His Spirit to fill the space or filling the space with my own ritual of right-spoken chatter, Christianese chanting and clapping-on-command worship-jigs? But, really, if I'm not practicing the discipline of silence in my daily worship why would I expect anything different from corporate worship? 3. Receive the Word as my daily bread. As there are definite hours in the Christian's day for the Word, particularly the time of common worship and prayer, so the day also needs definite times of silence, silence under the Word and silence that comes out of the Word. These will be especially the times before and after hearing the Word. The Word comes not to the chatterer but to him that holds his tongue. The stillness of the temple is the sign of the holy presence of God in His Word. There is an indifferent, or even negative, attitude toward silence which sees in it a disparagement of God's revelation in the Word. This is to miss the essential relationship of silence to the Word. Silence is the simple stillness of the individual under the Word of God. We are silent before hearing the Word because our thoughts are already directed to the Word, as a child is quiet when he enters his father's room. We are silent after hearing the Word because the Word is still speaking and dwelling within us. We are silent at the beginning of the day because God should have the first word, and we are silent before going to sleep because the last word also belongs to God. We keep silence solely for the sake of the Word, and therefore not in order to show disregard for the Word but rather to honor and receive it. Silence is nothing else but waiting for God's Word and coming from God's Word with a blessing. But everybody knows that this is something that needs to be practiced and learned, in these days when talkativeness prevails. Real silence, real stillness, really holding one's tongue comes only as the sober consequence of spiritual stillness. 4. Practice silence in the sanctuary, in community and in the ordinary tasks of life. While the scenes of the monks' prayers and song in corporate gatherings was almost unbearably beautiful, some of my very favorite scenes followed the holy men through their ordinary, daily tasks. Making a meal, tending a garden, cutting a brother's hair -- all tasks that are familiar to me here in my home, with my family. I'm old enough to know that, while it would be easy to romanticize the image of monks at work, it is just not so. Heat and illness and hunger and callouses and jealousy and depression feel the same on a French mountain peak as they do here in upstate New York. In other words, silence is a spiritual perspective. By spiritual I do not mean that it ignores the physical -- certainly time spent in a monastery, retreat center, or a walk on a country road may be an important part of practicing silence. But, you know as well as I, that if I do not exercise my will under the guidance of the Holy Spirit that pesky inner noise does not care about my outer environment. Practicing silence takes work. If we can pass through these initial fears and remain silent, we may experience a gradual waning of inner chaos. Silence becomes like a creative space in which we regain perspective on the whole. Practicing silence also brings unspeakable reward. Oh, that I could echo the calm assurance of a bushy-eyebrowed monk: God is infinitely good, almighty, and He helps us. In my week-long meditation (well, three weeks now if you count all the time it has taken me to write this post) no thought brought me more joy than these from another trust-worthy gentleman, the prophetIsaiah: In repentance and rest is your salvation, in quietness and trust is your strength. And no words brought me more fear than the prophet's condemnation of God's people at the end of that verse: but you would have none of it. May I obey the God of Isaiah, Bonhoeffer, and a Carthusain monk - the God who will lead me into the strength and rest of silence. Linking up with Emily today at Imperfect Prose.